Clinton Road has been said to be America’s Most Haunted Road. Why, you ask? Located in West Milford, NJ, this 10-mile stretch has been the scene of everything from phantom trucks chasing drivers down the road to alleged satanic rituals. 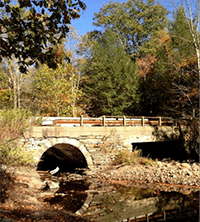 Most notably, Ghost Boy Bridge is said to be home to the spirit of a young boy who drowned in the creek pictured to the right. Legend has it, if you throw a coin into the water, the little boy throws it back. It’s also been said that he tries to push people in if they look over the bridge at night. Drivers beware! Did you know October 2nd is National Name Your Car Day? Can you guess the names of these famously named cars? Check your answers below! Autumn has arrived, and few things say fall more than apple cider! 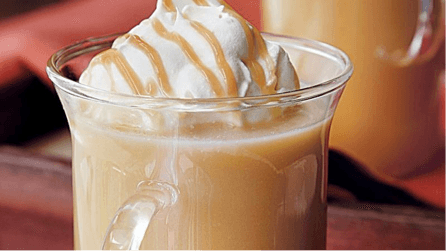 Enjoy this Caramel Apple Cider recipe from Betty Crocker to kick off the season! In a 2-quart saucepan, stir together brown sugar and ⅓ cup whipping cream. Cook over medium heat 2 minutes, stirring constantly, until bubbly. Stir in vanilla and apple cider. Cook 10 minutes, stirring often, until thoroughly heated. Serve cider in mugs. Top with whipped cream, caramel topping and cinnamon. Clean your car - inside and out! Washing and waxing your car will not only protect it from the wintry precipitation, but also will make it easier to brush off. Since you’ll be spending a lot more time in the car with the windows up, take some time to clean out the inside of your vehicle, too. Check your wiper blades and fluid level! Wiper blades typically last about six months, and finding out they don’t work when you need them is not something you want. Check those tires! The condition of your tires is critical in the fall and winter months. Starting, stopping and maneuvering on slippery roads can be a much better experience with good winter tires. Check your battery! Cold weather can really take a toll on your vehicle’s battery. Inspect your heating system! Not only does this make for a more comfortable drive, your heating system is important in keeping your windshield clear. Prepare an emergency kit! Unfortunately, some situations are unavoidable, so it is always good to be prepared. Check out this list for some essentials. Need help with any of these steps? Bring it in to us today to make sure you’re prepared for the winter months ahead!